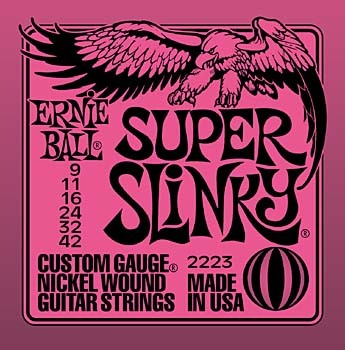 Yup, I use Ernie Ball Super Slinky .009 gauge strings :-). I use Dunlop Tortex .88mm picks. I use a Yamaha YT-250 Chromatic Tuner. I have a Danelectro power supply with a daisy chaining cable to power both my pedals... It works fine, although at some point a power brick or something would probably be better ;-).